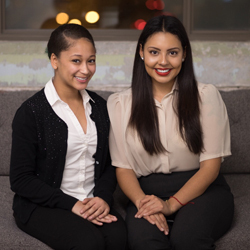 Cinthya Bolanos and Kynnedy Tuggle are community-minded student entrepeneurs. Cinthya is an Educational Studies major at Rhodes College. She started a program called “Juntos” which provides Latinx elementary students books and spreads information regarding early childhood literacy. She also worked with Regional One Health to develop an Innovation Playbook that will help foster a culture of innovation in the hospital. She is currently working on developing an ordering and delivery system designed for stadiums called Clu. Kynnedy is an Educational Studies major at Rhodes College. She started a small business, Love in a Kup, designed to provide quality, yet affordable cupcakes to urban communities around the city of Memphis. After graduating, Kynnedy plans to take steps to attend graduate school, teach in an elementary school in Memphis and continue to grow Love In A Kup.